Hazel’s Cottage in Keswick sleeps 4 people. This charming cottage was originally part of an early 19th century coach house and provides cosy holiday accommodation. 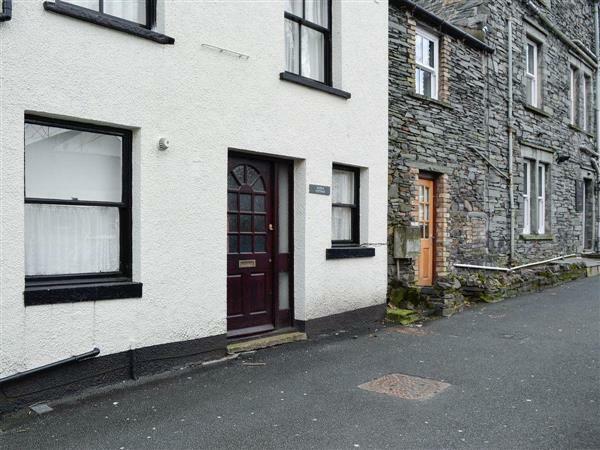 It is ideally situated in a small lane, only a two minute level stroll from the popular and bustling Lakeland market town of Keswick, where you can enjoy excellent local atmosphere and amenities. The scenery surrounding Keswick is dramatic and spectacular, and Alison’s Cottage is an excellent base for fell walking, touring, cycling or just relaxing and taking a cruise up the lake. There is a leisure centre, golf, water sports, a theatre by the lake, and fishing all nearby. Shop 10 yards, pub and restaurant 20 yards. Ground floor: Lounge, dining room/kitchen. First floor: 2 bedrooms - 1 5ft double, 1 bunk, bathroom with shower over bath, toilet & basin. Services: Elec fire. Central heating. All fuel, power, bed linen (duvets) & towels included. Parking for 1 car. Cot. High-chair. DVD player. Gas hob. Electric oven. Fridge/Freezer. Microwave. Washer/dryer. Two pets welcome. Non smokers only. Holidays at Hazel’s Cottage run from Friday to Friday. For a better idea of where Alison’s Cottage is, you can see Alison’s Cottage on the map below. Alison’s Cottage is in Cumbria; should you be on the lookout for a special offer, you can find all the special offers in Cumbria. It's always worth checking to see what is on offer at the moment. Do you want to holiday near Alison’s Cottage (24633), you can see other cottages within 25 miles of Alison’s Cottage; have a look to find your perfect holiday location.